With diabetes such an epidemic today, it is essential that you know exactly what it is. Why? Well, to prevent getting diabetes yourself that is! In layman terms, “diabetes” is the inability of the body to process sugars properly. When we eat or drink, our “pancreas” produces a hormone called “insulin”. Insulin is released into the blood and helps to regulate the amount of glucose (sugar) in the bloodstream. Diabetes is a condition where this process does not function correctly. The reason why diabetes occurs is because no insulin is being produced (often called Type 1 Diabetes) and requires the sufferer to use insulin injections, or insulin is produced but the body becomes resistant to it. This renders the insulin ineffective. This is normally called Type 2 Diabetes and is rapidly becoming more common. The danger is that while diabetes is not immediately life threatening the long term effects of high blood sugar can be damaging to one's health. Uncontrolled diabetes and prolonged high blood sugar levels can, in later life, cause problems to many organs including the kidneys, eyes, nerves and the heart. This may sound grim, however controlling blood sugar by a combination of medicine, diet and exercise will vastly reduce the long term complications. Recent research shows that 2 in every 100 people have diabetes. Alarmingly half of these people do not even know they have it. 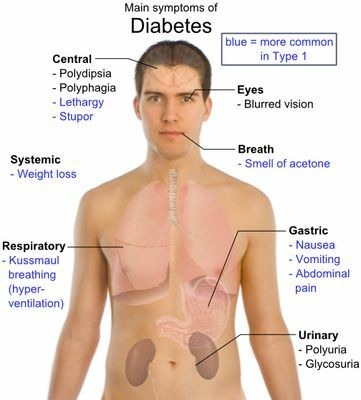 Many people have diabetes without being aware of it because someone with diabetes looks no different from anyone else. Treatment can include following glycemic index food list items, and choosing items which have a low glycemic index value. How do you find out if you have diabetes? The simplest way to check if you have diabetes is to arrange a blood sugar check with your doctor. A tiny sample of blood, obtained by pricking a finger is checked using a small electronic tester. A normal blood sugar level is generally between 72 – 126 mg/dl or 4 – 7 mmol/l (where 1 mmol/l = 18mg/dl). If the body is unable to keep the blood sugar level within these limits, then diabetes is diagnosed. Diagnosis of diabetes can occur out of the blue during a routine check-up but more often it follows from the sufferer experiencing the "symptoms" of diabetes. These symptoms can be many or few, mild or severe depending on the individual. Loss Of Weight – Glucose is the form of sugar which is the body's main fuel. Diabetics cannot process this properly so it passes into the urine and out of the body. Less fuel means the body's reserve tissues are broken down to produce energy with a resultant loss in weight. Thirst – Often it seems no matter how much you drink your mouth still feels dry. The problem is compounded before diabetes is diagnosed by sufferers drinking huge amounts of sugary drinks! Of course this only increases the blood sugar level and leads to increased thirst. Urinating More Often – Sufferers need to urinate often and pass large volumes each time. In addition this symptom takes no account of time so sleep is constantly disturbed by having to visit the bathroom during the night. It is a mistake to think this is caused by the increased thirst and drinking more. On the other hand, high sugar levels in the blood spill over into the urine making it syrupy. To counter-act this water is drawn from the body causing dehydration and therefore thirst. If you have experienced any of these symptoms it does not necessarily follow that you are diabetic however it might be advisable to visit your doctor to be sure. If it does turn out that you have diabetes please do not panic! It can come as a shock and it will mean some changes in your life. While it is incurable it can be treated so the long term complications are reduced or even eliminated. By knowing exactly what diabetes is – and recognizing the symptoms early on – you can prevent it from ever building up within you. Start today by monitoring your health and daily eating habits. Or as they say, preventing is better than finding a cure later on! What Exactly Is the Glycemic Index Diet? What’s Your Worst Offending Glycemic Index Food Craving?! Copyright © 2019 Glycemic Index. All Rights Reserved.